A new study finds mangrove soil held around 6.4 billion metric tons of carbon in 2000. Between 2000 and 2015, up to 122 million tons of this carbon was released due to mangrove forest loss – roughly equivalent to the annual emissions of Brazil. More than 75 percent of these soil carbon emissions came from mangrove deforestation in just three countries: Indonesia, Malaysia and Myanmar. Mangroves provide a slew of benefits in addition to storing carbon, reducing flooding and erosion from storms, acting as nurseries for fish, and filtering pollutants from water. Research indicates at least 35 percent of the world’s mangrove forests may have been lost between 1980 and 2000. Mangroves are deforested for many reasons, including to make room for shrimp farms and other forms of aquaculture, as well as for their wood. Mangroves also depend on the presence of freshwater and can die when dams and other developments stem the flow of rivers. Scientists also believe they’re at risk of mass drowning as global warming raises sea levels. Straddling the interface of land and sea, mangrove forests are of two worlds. Their branches provide homes for lizards, snakes and nesting birds, while their roots, when submerged, become protective nurseries for baby fish and sanctuaries for marine mammals. Mangroves also provide a slew of benefits for coastal human communities. They act as storm barriers, protecting inland areas from flooding and erosion by dissipating the energy of big waves. They help filter river water of pollutants and trap excess sediment before it reaches the ocean. Their role as fish nurseries can have big impacts on local economies and food production. Zooming out, mangroves also have a big impact on climate. Although they’re only found in tropical areas and cover an estimated 140,000 square kilometers – less than 3 percent the extent of the Amazon rainforest – mangroves are powerhouses when it comes to carbon storage. Studies indicate that, pound for pound, mangroves can sequester four times more carbon than rainforests can. Most of this carbon is stored in the soil beneath mangrove trees. Uniquely adapted to their habitats, mangrove trees are able to filter out salt and breathe through their roots. Researchers estimate the monetary value of the benefits, or “ecosystem services,” provided by mangroves at $194,000 per hectare annually. Multiplied by their global extent, that means the world’s remaining mangroves provide around $2.7 trillion in services every year. But a new study suggests the real value of mangroves may be higher still. 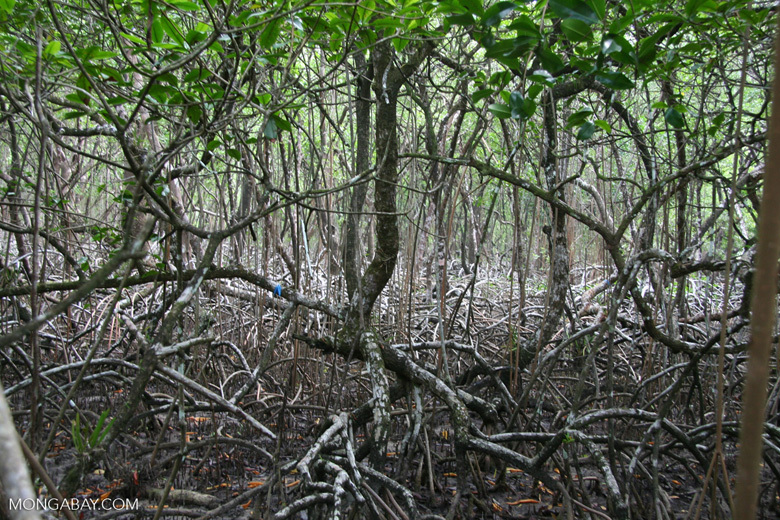 It finds much more carbon may be locked up in mangrove soil than previously believed. The study, published recently in Environmental Research Letters, finds mangrove soil held around 6.4 billion metric tons of carbon in 2000. This is dramatically higher than previous estimates that pegged the carbon content of mangroves (both soil and biomass) at around 4.19 billion metric tons. The results also indicate that between 2000 and 2015, up to 122 million tons of this carbon was released due to mangrove forest loss. 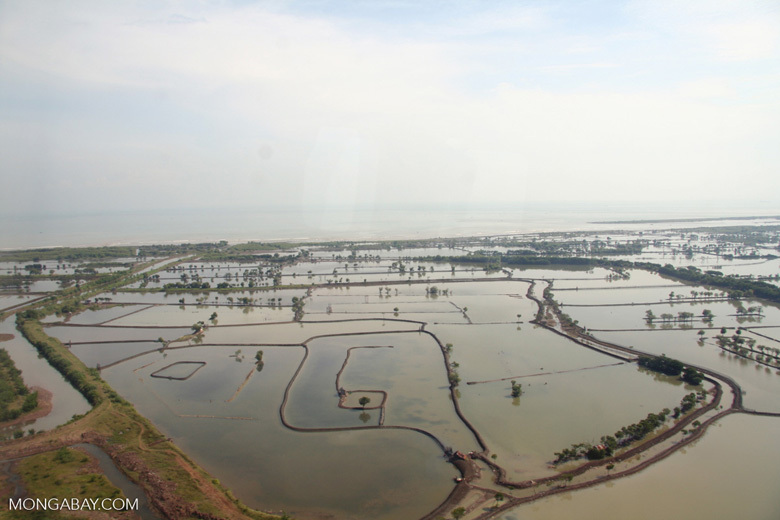 A mangrove area cleared for aquaculture in Indonesia. The study was conducted by Sanderman and 20 other researchers from institutions around the world. They created a model that used a type of artificial intelligence called “machine learning” to infer the soil carbon storage of mangroves globally based on vegetation, climatic, topographic and hydrologic conditions detected through satellite imagery. They then overlaid tree cover loss maps also obtained through satellite imagery to estimate how much carbon may have been released through deforestation and other kinds of forest loss. Their results indicate between 30 million and 122 million metric tons of soil carbon was lost over 15 years from the estimated 6.4 billion tons present in 2000. This equates to between 111 million and 447 million tons of C02, which means mangrove deforestation may have released nearly as much CO2 as Brazil, the world’s 11th-biggest emitter, did in 2015. According to the study, more than 75 percent of these soil carbon emissions came from mangrove deforestation in just three countries: Indonesia, Malaysia and Myanmar. But when it came to the biggest percentage lost since 2000, Guatemala came out on top. According to the researchers, the Central American country lost as much as 6.8 percent of its mangrove soil carbon over 15 years. 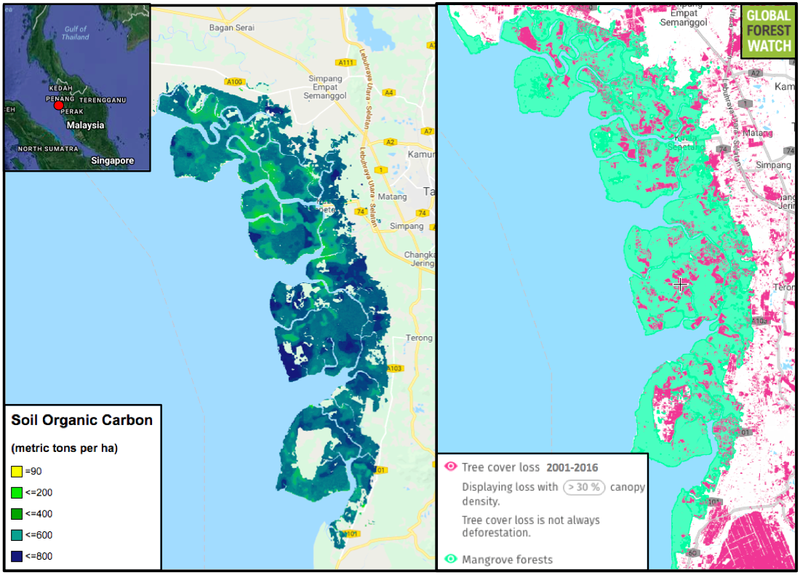 The left image shows the estimated soil carbon content of Malaysia’s Matang mangrove in 2000 (Sanderman et al., 2018), while the right image shows mangrove extent in 2010 and 2001-2016 tree cover loss. 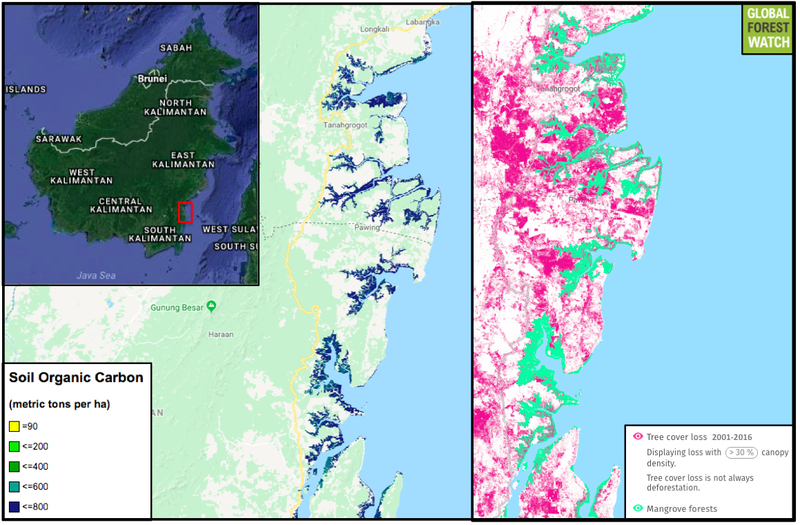 The left image shows the estimated soil carbon content of a mangrove near Balikpapan, Indonesia, in 2000 (Sanderman et al., 2018), while the right image shows mangrove extent in 2010 and 2001-2016 tree cover loss. 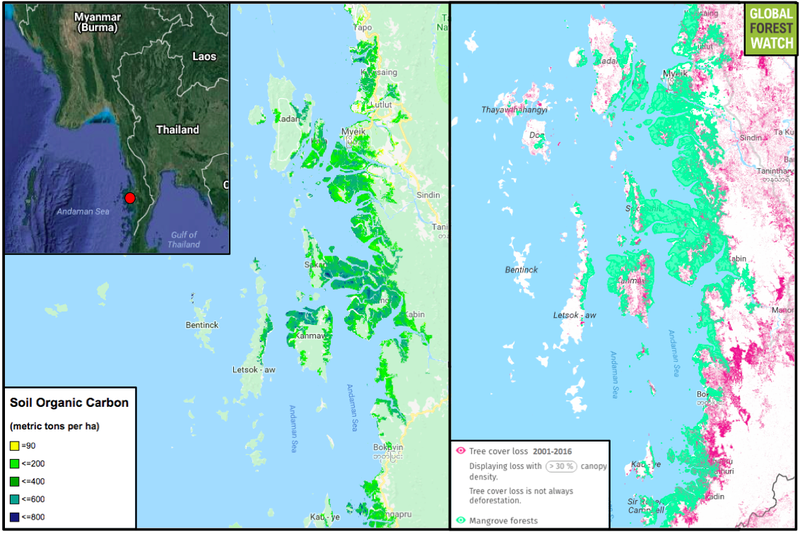 The left image shows the estimated soil carbon content of a mangrove in the Tanintharyi region of Myanmar in 2000 (Sanderman et al., 2018), while the right image shows mangrove extent in 2010 and 2001-2016 tree cover loss. 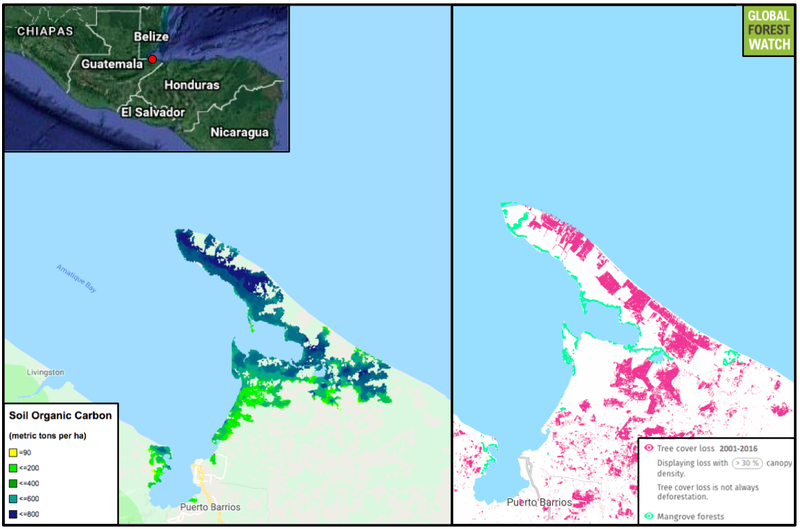 The left image shows the estimated soil carbon content of one of Guatemala’s few mangrove regions on the country’s eastern coast in 2000 (Sanderman et al., 2018), while the right image shows mangrove extent in 2010 and 2001-2016 tree cover loss. While there isn’t a consensus, studies indicate that at least 35 percent of the world’s mangrove forests may have been lost between 1980 and 2000. Mangroves are deforested for many reasons, including to make room for shrimp farms and other forms of aquaculture, as well as for their wood. They depend on the presence of freshwater and can die when dams and other upstream developments stem the flow of rivers. Scientists also believe mangroves are at risk of mass drowning as global warming raises sea levels. The researchers write say their results can help nations determine which of their mangroves are storing the most soil carbon and thus, from a climate perspective, which should be given protection priority. To this end, they’ve made a map of their results publicly available. Sanderman, J., Hengl, T., Fiske, G., Solvik, K., Adame, M. F., Benson, L., … & Duncan, C. (2018). A global map of mangrove forest soil carbon at 30 m spatial resolution. Environmental Research Letters.